It’s blowing a minor gale when I wake, and I think I might have made a terminal holiday mistake. 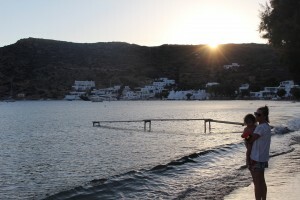 Think maybe this tiny little bay huddles on the undesirable windward side of the island, Sifnos. Maybe I should have researched a little more thoroughly. Maybe the reason it’s comparatively peaceful (at this high point of a European summer) is that it’s too windswept for anyone’s comfort. Still, I step the eight paces from our room’s front patio, cross the narrow strip of caramel sand. Wade out, dive under. Usually I don’t open my eyes underwater, but here it seems rather rude not to. All the blues from the Mediterranean sales pitch radiate in gorgeous ombre shades around my arms as I glide forward. Vathi bay is a near-perfect circle guarded by a pair of tall scrubby headlands, which frame the Cycladic view across to Kimolos and Milos beyond. Scrawny beaches are punctuated by chunks of rock. Drifting in the middle of the calm bay, I look back to the village, a single strip of whitewashed buildings shouldering a third of the shoreline. 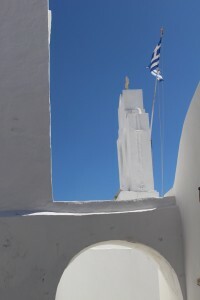 Among a cluster of guesthouses at the northern end of the beach nestles one small church: white dome, bells strung beside. The hills and cliffs rising behind the village, clad in olive trees, ancient stone terraces, goats, and heaps of rocks, amplify this morning’s wind, sending gusts in four directions. Conversely, the geography affords a comfortable refuge: nodding out in the bay is a small flotilla of charter yachts, some private round-the-world salty types, cute wee local fishing boats, and a pair of seriously moneyed super yachts dominating the wharf next to the church. You can traverse from one side of the village to the other in about ten minutes (either along the modest strip of sand, or waist-deep in warm ocean). 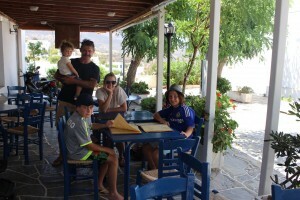 I gather my family, throw on a sarong, and we walk around to order breakfast at the Tsikali taverna. We don’t wear shoes in Vathi. Like most of the restaurants and tavernas here (there are maybe a dozen), the tables face the sea. We dig our toes in the sand, and the toddler throws stones into the water in front of us. With our omelettes, one of us drinks strong Greek coffee. The other is not so brave, and takes the pan-Euro option. Afterwards, another dip – the wind has dropped and it’s bloody perfect. We catch the local bus up to the island’s capital, Apollonia. It’s a striking drive beside rocky hills, with views over olive groves to coves and beaches below. They’ve been farming hilly Sifnos for millennia, and they say some of these rock-walled terraces are as old as the ancient Olympics. Apollonia is a postcard. Stone steps, white churches, potted geranium, oleander, basil. 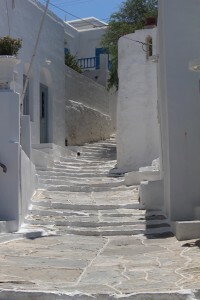 Along the pretty lanes are stylish clothing and jewellery stores, as well as bars and tavernas. At night, the main lane transforms into a vibrant, charming place to dine and play. 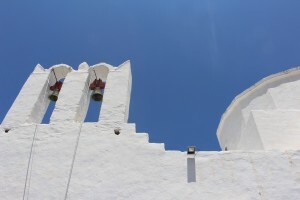 But now it’s lunchtime, and an opportunity to indulge in more of Sifnos’s celebrated fare: chickpea balls, tzatziki, kid in wine or baked with oregano, rabbit stifado. The Sifnos cheese, Manoura, is divine: tangy, a little salty, with a texture ranging from ricotta-like to quite firm. We lunch and watch the not-quite busy avenues slowly quieten. The pedestrian buzz slows, and everyone fades away for siesta. And so it is for us, back home to sleep. It’s been a tough morning so far. You wouldn’t guess our room used to be a boat shed. Frantzesko Sardi used to spend every summer here at his grandfather’s house on the waterfront. Now, he lives here with his wife Evi Manoli and their young son, while they host guests at their adjacent guesthouse, Aerides. With fortuitous timing, the family escaped a corporate existence a few years ago in Athens and converted Papou’s old sirma (or boathouse) into three light-filled, comfortable rooms with private bathrooms and shared kitchen. With the range of reasonably priced fare at neighbouring tavernas, I doubt this kitchen sees much serious action. The family are charming hosts, sharing toys for our youngest son, and an old windsurfer base for the older boys to play with. My three sons balance on the board and paddle around the safe harbor. 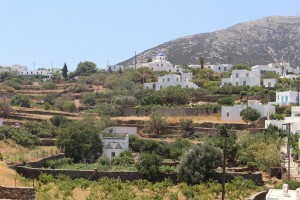 Vathi’s electricity was only switched on in the late 1990s, when a road was built to connect this south-western bay to to the rest of Sifnos. Tourists were visiting before then, Sardi tells us. Intrepid travellers who took one boat then another and who savoured the relaxed fishing-village vibe. I envy them a little, but even though tourism now completely trumps fishing, Vathi retains an uncomplicated atmosphere. At one end of the beach, there’s a glam resort owned by a local shipping magnate, but you’d never know unless you looked for it. Even the thrusting super yachts don’t really spoil the village feel. Refreshed in the afternoon, we walk to the western end of the bay and explore the trails leading up and over the headland. 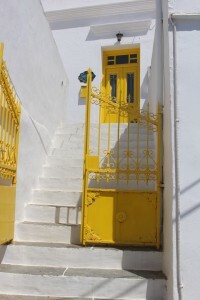 Sifnos has a large network of walking trails and is popular with more serious hikers, which we are not. What we would prefer to be are serious bons vivant. 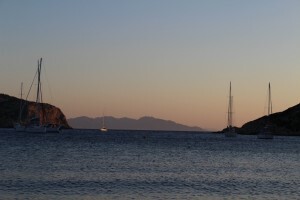 So, returning from our little stroll, we pause at another taverna, Symposio, for a sundownder. Vergina beer and olives for the adults, lemonade, water and Sifnos “village” sausages and fried potatoes for the juniors. As the sun sets, my oldest son and I wade home chest-deep across the bay. The golden hour has turned the water’s surface metallic. We lie on our backs and chat, and kick sprays of silver, gold, platinum. I could not be more content. We return to Aerides and our host presents a bottle of his olive oil, pressed from olives in their own Sifnos groves. Organic. Tells us to use it sparingly, as it’s quite strong. I can’t wait to open it. Dinner is at a local institution at the other end of the beach. Manolis Restaurant has served here, under a ceiling of gnarly old trees and stars, for decades. Feet again in sand, we gaze out to a makeshift jetty (or rather, a few planks propped up in the water) where our boys had played earlier. We eat hearty Sifnos fare: baked goat and lamb chops and souvlaki made from tender pork neck, crisp Greek salad, all from the restaurant garden and the Manolis farm on the other side of the island. We drink very good house wine. The meal costs less than 60 euro for five of us. Later, after I ask in passing about the island’s fig trees, our waiter disappears, returning with figs picked from the garden behind the restaurant. 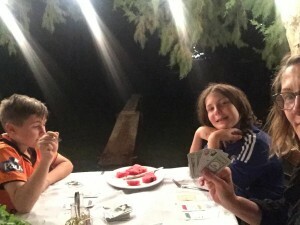 My partner takes the baby home, and I play cards and eat watermelon with my older sons, a string of light bulbs shining in the branches above us, also reflected in the ocean a metre away. There is not a whisper of wind: no holiday mistakes here, after all. This has been a very good day.